Prototype 0 team and our friend Marchettino visited the Pagani Automobili headquarter in Italy for a factory tour of two buildings, the old and the new factories. 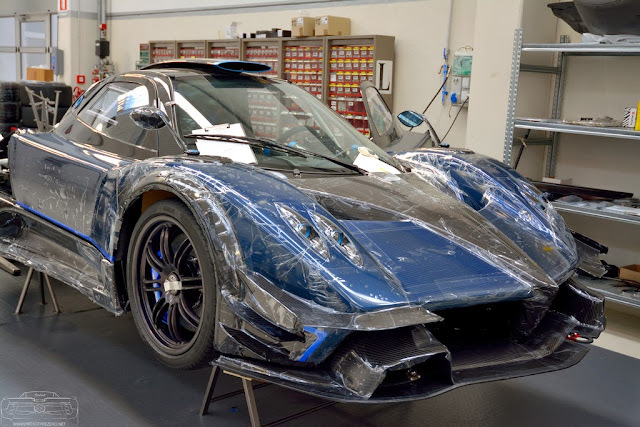 Firstly we visited the main office which includes: showroom, where Pagani welcomes clients; the offices, where Hoarcio and his team of engineers and designers work and and finally the production area, where until a short time ago Pagani cars were assembled. 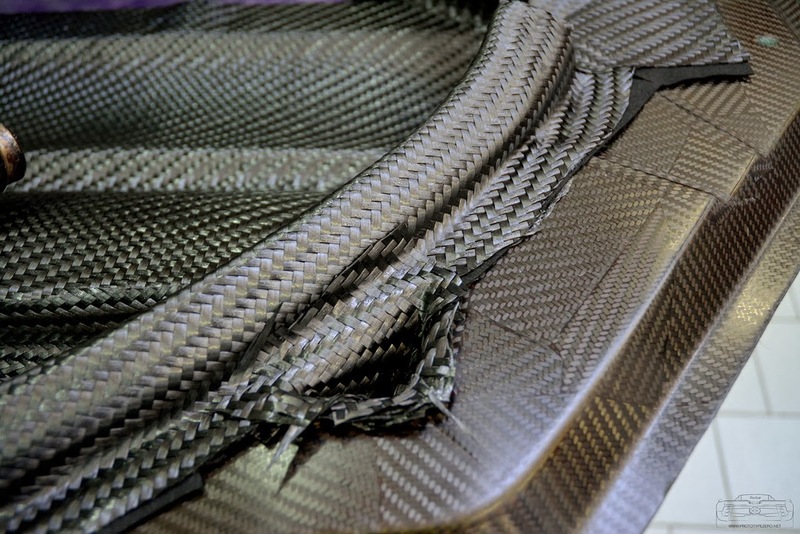 Now this area is dedicated to the carbon fiber manufacturing. 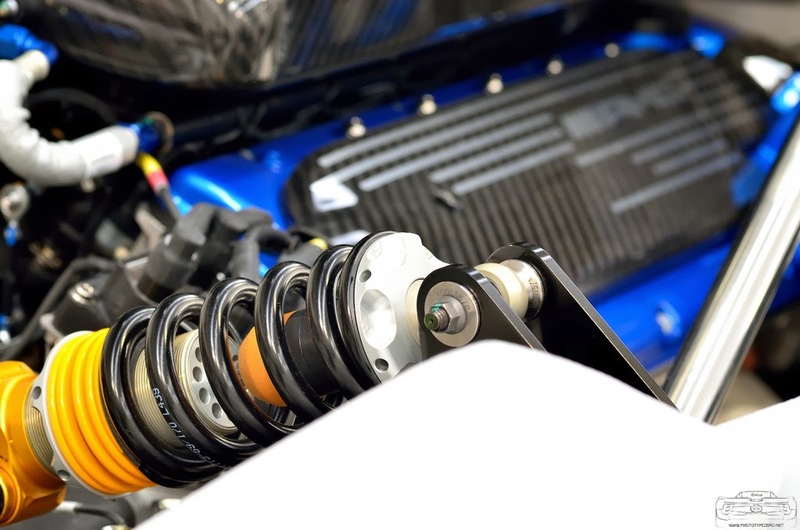 It's early morning of a winter sunny day, we already knew what to expect being about the twenty-fifth time we visited the factory, but when you enter the showroom, a surprise is always there. So we ring the bell of the showroom where Luca Venturi, Pagani's Press Officer, was waiting for us. We entered the showroom and there she was! The last weapon that Horacio presented before retiring the Zonda, the Zonda R Revoluciòn! 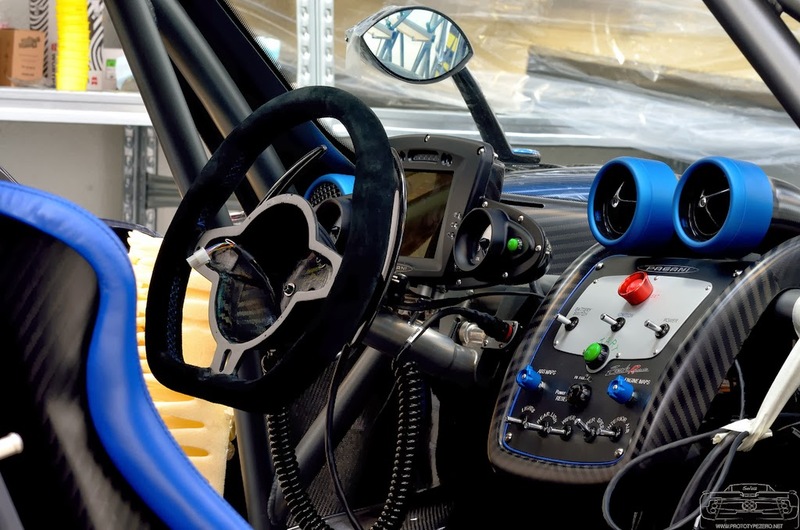 The car was exhibited in diagonal at the center of the showroom surrounded by Pagani memorabilia, a Pagani-style audio system, numerous Pagani models and some Horacio's creatures like a single-seater racing car and a motorcycle built by himself when he was young. We were amazed by this car and we started to photograph it for long time. Even if that wasn't the first time we saw this beast, it's always a rare opportunity to meet "her", especially if “she” is there, just for us! In May, at the start of the Vanishing Point, annual Pagani gathering, we have been the first to display this car. After one hour around the Zonda, talking with Luca and other polite workers, we entered inside the atelier. Here until last year Pagani supercars were assembled. Now this area the manufacturing center of the carbon fiber while the assembly line has been moved in the new building, 1 kilometer far from the headquarters. We entered in this area and noticed that the carbon fiber room was off to the right and on its own. You could hear the humming of the heat guns coming from the room on the side. This area is composed of three main halls, a small one where workers with extreme carefully cut and work large sheets of carbon fiber and carbo-titanium which is the last introduction and patent of Pagani. Basically it is the carbon fiber woven with a titanium wire, it is stronger and lighter than the steel and it is utilized for the car monocoque. 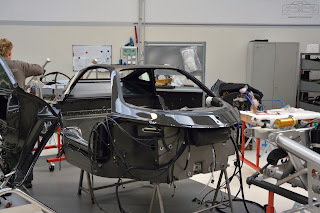 The main room is where the Huayra was born, here the monocoque and all the body panels are under construction. All workers carefully place the carbon fibers perfectly aligned on the molds and on the chassis heating them into position and making sure every seam is lined up exactly, only a tiny wrong movement makes the piece unusable for the factory’s standards.These people aren’t workers or mechanics, they are artists. 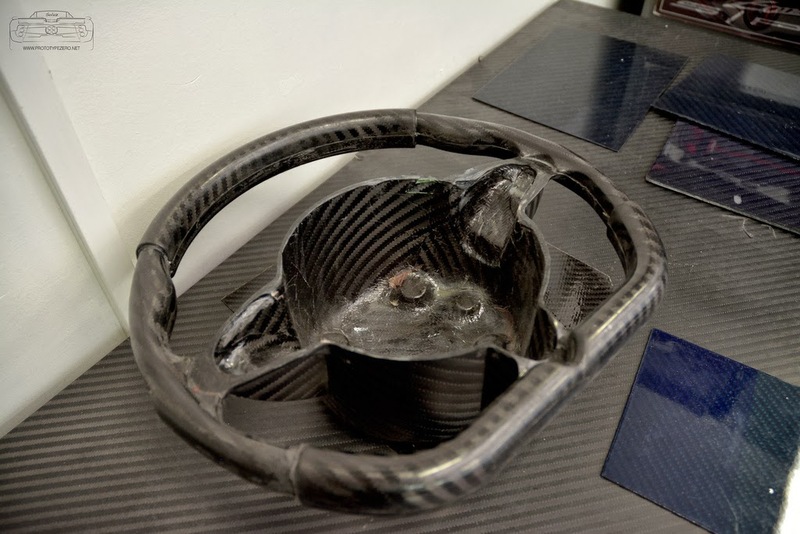 The attention to detail inherent in all carbon fiber parts and the usage of the carbon-titanium composite are excellent examples of that. The third and last room holds two big autoclaves utilized for the carbon fiber pieces vacuum cooking. 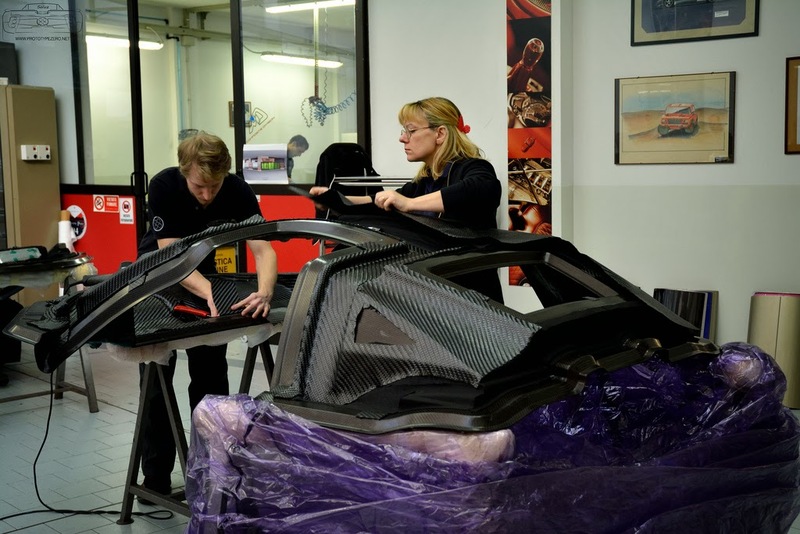 Carbon fiber is anywhere in the workshop, but it is not only the focus on this composite which makes the Pagani supercar a one-of-a-kind vehicle. 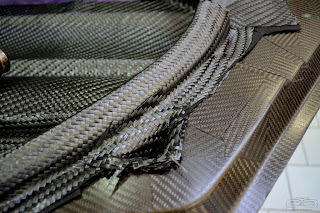 The amount of special, unique and tailored parts used on the Pagani cars is endless. Every single part of aluminum used in Pagani vehicles is obtained from a block of aluminum, such as the speedometer which is produced for Pagani by a Switzerland watches company. 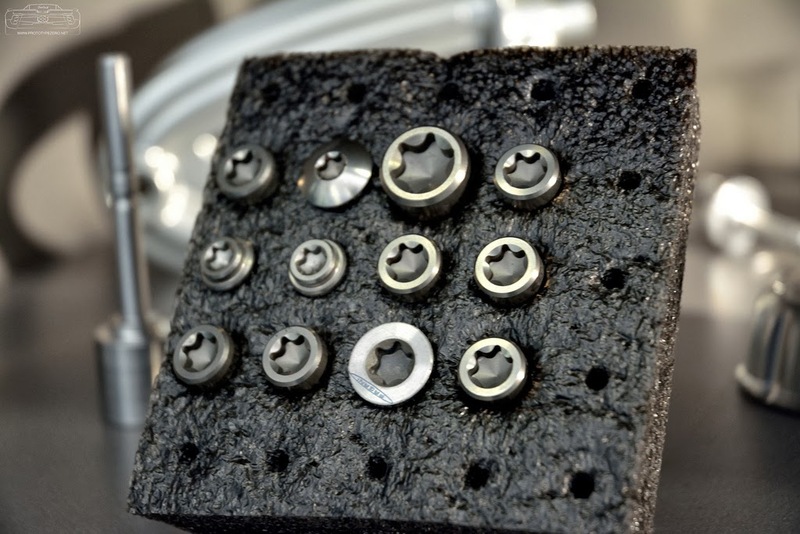 Another example is a single nut or bolt used in the automotive or aerospace industry costs around 8 euros, Pagani’s version costs 18 euros and it has improved strengthens and it also has the Pagani logo engraved in it. After this amazing lessons on the carbon fiber manufacturing and its employment on Pagani car we went to the new factory. This building is operative since last year but now it's completely ready for the production. The warehouse on the side is going to be demolished. The most ardent fans can remember it for the various pictures of the epic Pagani line up. 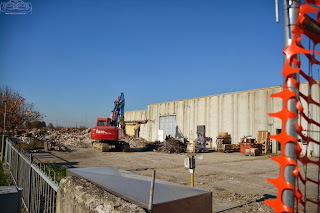 Here the headquarter of the new factory will be built. We entered the new production line and we could see the two Pagani Huayra being built for their customers. 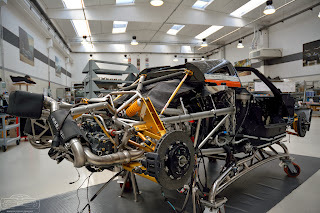 One right hand drive car with Saint Tropez orange body paint and with fully visible carbon fiber along the body (chassis N°34) and another one in early assembling stages (chassis N°32). A third Huayra (chassis N°36) was there waiting for road tests. 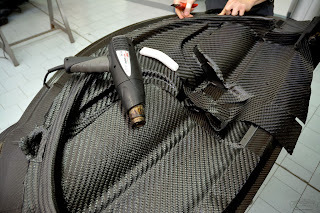 This very particular car features a fully visible carbon fiber body, clear coated carbon fiber along the body and matt carbon fiber on the remaining panels. All the body is characterized by red profiles and stripes. 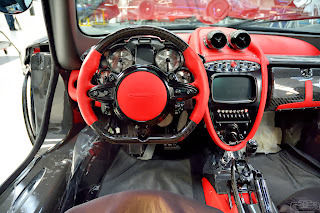 The cockpit features red leather interior with carbon fiber details. All aluminum parts such as the central console or the shift knob are burnished. This car also features left hand drive, track pack, red brakes calipers and black wheels. Also the Huayra #007 was there for its first service. On the left side of the assembly room we found another very impressive beast sleeping. The Pagani Zonda R Revoluciòn 5 of 5 was there, waiting for tests drive. 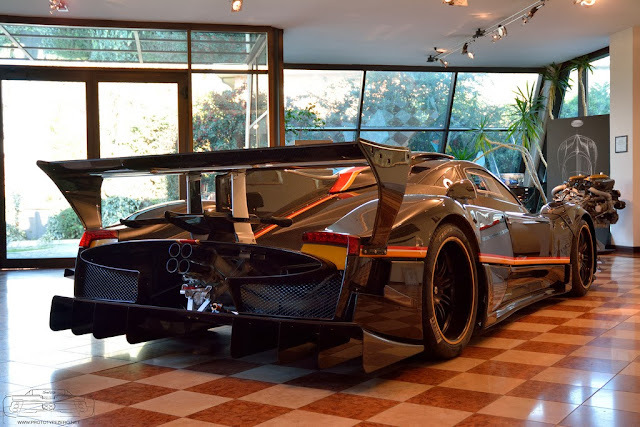 If you thought the Zonda Revo inside the showroom is an impressive car you haven't seen yet this one. 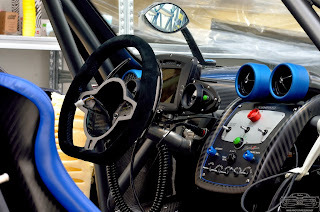 This particular Zonda R features a fully visible carbon fiber body very similar to the Zonda Tricolore paint scheme: blue tinted carbon fiber, blue brake calipers, blue leather and alacantara interior, black wheels, blue and burnished details inside the cockpit, on the engine bay and on the body. This car will be owned by a famous Pagani collector who already owns seven Pagani vehicles. Another special Zonda was there, a new special one off for a Chinese customer. 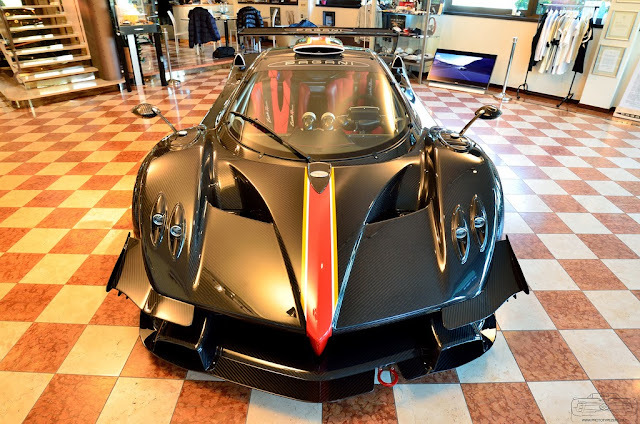 The car features the same specifications of the Zonda 760 RS, the only difference is the chassis which is made in carbon fiber instead of carbo-titanium because this car is built on a 2005 Zonda F. The body is characterized by a two tone colors configuration like the Zonda Tricolore, fully visible carbon fiber body surrounded by Tricolore stripes in the central part of the front bonnet and purpura tinted carbon fiber instead of blue in the remaining body panels. The interior are cream leather. The car also features 760 RS front side wings, Zonda R air intakes for brakes cooling, the classic red side stripes like the major part of the Zonda F, red brake calipers and polished Zonda F wheels. At the moment I was too excited and I forgot to check if the car featured a manual or sequential gearbox. Unfortunately I am not allowed to share pictures of the car being a request of the owner. After all a brand new Zonda carbo-titanium chassis was there under assembling, the car should be the last car built of the Zonda 760 series. 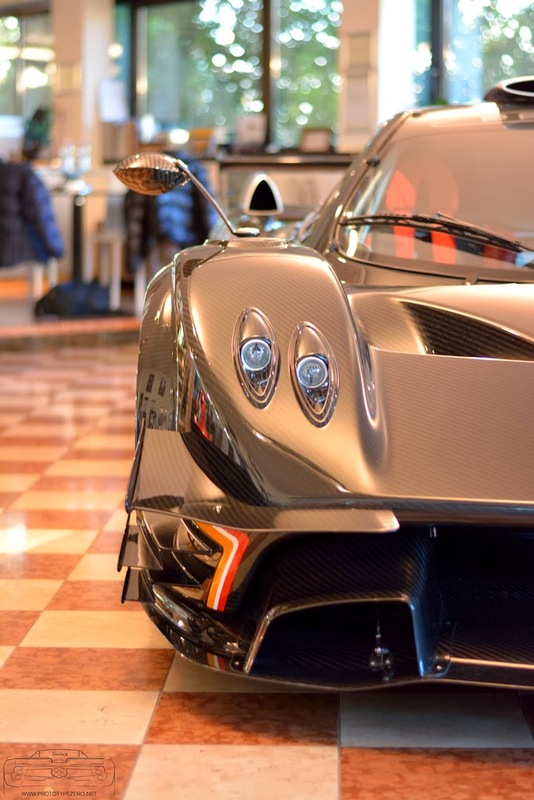 The future for Pagani looks bright. In the upcoming year three Vanishing Point will be organized for the first time in the Pagani story, one in Europe, one in China and one in USA. The order book is filled for at least four years, the Asian and US markets are more and more increasing. Pagani will produce 125 unit Coupè and 125 Roadster of the actual Huayra to which must be added all the future special series. In the end we had a good lunch with Luca. We would like to thank him very much because he has been very cordial and made our day unforgettable. Prototype 0 Pagani Factory Visit, view all my pictures on Flickr.